The CGC Program teaches good manners to dogs and responsible dog ownership to their owners. The 10-step Canine Good Citizen test is a non-competitive test for all dogs, including purebreds and mixed breeds. The CGC award is a prerequisite for many therapy dog groups. Some homeowner's insurance companies are encouraging CGC testing, and an increasing number of apartments and condos require that resident dogs pass the CGC test. 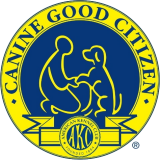 The CGC Program also includes the AKC CGC Responsible Dog Owner Pledge. The dog will permit someone to check it's ears and front feet, as a groomer or veterinarian would do. Following the evaluator's instructions, the dog will walk on a loose lead (with the handler/owner).